Beggars can't be choosers! ;D So no, this is not against the rules. Some people just have impressive quantities of junk stored up and occasionally they'll do a spring cleaning of their SDB by donating things to the Money Tree. If you're looking for high-quality items, the Money Tree probably isn't the best place to be hanging around anyway. Yep, it sure is! More people may have it these days, so maybe there are less new people who are cropping up with it? *shrugs* Nothing about the avatar has been changed, so that's our stab-in-the-dark guess. This means I have to get blasted more, right? *headdesk* You know, this could explain why so many recent entries to the Neoadventure Spotlight have been imageless. D: Thanks for bringing this to our attention. We'll ask a programmer to look into it. We were just saying that it was obvious that the magazine title would have to be on the cover of the magazine. We didn't mean that the title was supposed to be "DURP!" XD Judging by the entries, you weren't the only one to interpret the instructions this way, so don't feel bad! We'll try to be a bit more clear in the future. Sorry, this isn't allowed. You can't misrepresent your Neopet in this fashion. Most articles use art that is already drawn, but we also usually do a few pieces of brand new art by request that fit a certain story each week. Consequently, these images go into the pool of NT art, so each week we have a greater variety of art to choose from to fit with articles. Hahaha! Alas, it wasn't a hint for the Bonju avatar. We just had a slight categorical mistake from the release of the item, which has now been corrected. Darn it, TNT! 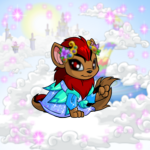 I'm a special colour, not a restock Petpet! Okay, first off: gathering a bunch of keys and turning them in at the same time does not affect your prizes at all. There's no difference between turning in one gold key at a time or turning in a dozen at once. Second, enough with the plotting guys! Just play the game, win if you win, lose if you lose. The hypothetical situation above is certainly not allowed. First off, if the question is of a personal nature (such as "What did you warn me for?!?") and therefore it wouldn't benefit a lot of people, we'll probably skip over it. If it's been asked before and asked in a more clear fashion, then we'll probably skip it, as well. Some questions we simply don't have an answer for, so we can't really answer them here. Mostly we keep an eye out for questions that are generally unique, apply to a lot of other people, and are stated in a clear manner. 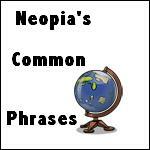 The grandfathering wasn't a blanket thrown over all inappropriate Neopet names from some certain point forward. Old Neopet names that would have never been acceptable will still be deleted. The ones that are grandfathered in are ones that we probably wouldn't have deleted back in the day, but these days would not be welcome. No, that's just fine. It's very sweet of you to play the site with your sister. If someone is too young or is challenged in a way that they can't play the site themselves, you are more than welcome to assist them, or let them enjoy the site with you. We try to spread it out as best we can, because you're quite right; not everyone reads every issue, and there are some things that just bear repeating (such as avoiding scam sites, multiple account rules, and other common issues). We appreciate our regular readers who understand that not everyone is as dedicated a reader of the Editorial as they are and understand why we do have to repeat ourselves from time to time. Well, we all know that the Jelly World board is just a rumour, but so is the the rest of this. If someone can't point to evidence that a Neopets employee stated this somewhere (and, really, why would they? ), then just assume that it's a silly rumour. That's as ridiculous a rumour as there being an entire world made of jelly!